Yes, Black Americans we have come in from the darkness of the whips and chains, racial hatred, racial bigotry, and racial violence in this nation; but in reality, as it relates to black and white relationships, economic equality and just pure justice; America, as the supposed guiding light republic of democratic principles, continues to fail us miserably. So until this nation provides a full redemptive solution to the race issue as well as the creating true solutions to economic, social, and civil justice inequalities. America and Americans will continue to linger in the darkness of racial ignorance and racial avoidance. For once we need to be upfront about our true feelings black to white and white to black. Maybe then and only then will a meaningful dialogue occur that will benefit the whole of America, both White America, and Black America. We will finally understand how history yours and ours are intertwined. How do you accomplish just a fete? By simply building up and not ignoring any community no matter the location or the color and creed of that communities inhabitants. You see each of these people have something in common. They have a vested interest in securing some aspect of the faded and sometimes lost American Dream. You demand that our branches of national and state governments provide economic, educational, social, judicial equality to even the most broken communities. This will strengthen the whole of this nation of plenty. Until that happens the dark sheet of distrust and human torment will continue to gather energies that will drive down the spirit of this nation. You see until this occurs and it really never has occurred, truly, America will never be truly great for the vast majority of Americans, no matter their race or ethnicity. It will continue to milk away at any true sense of greatness. Americans can't be great in any real sense without the power of love, empathy, and compassion for the least of the most misfortune of its citizens. If we want a nation that cares we must wipe away all those seeds of ignorance that continue to produce fields of hate. We have to turn the education of youth away from the most basic understandings to a complex desire to critically comprehend true national and international issues. 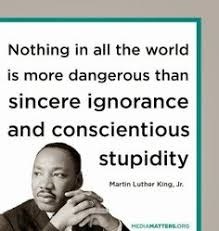 Simply put conscientious stupidity is no longer acceptable on any level. So do you really wanna know how to build a that great America shining on the horizon? You simply won’t build it with bricks, mortar, electrical fences that close off thought. That is a simple solution to maintaining this country’s path of bleakness, inequality, disparity, greed and social separation. If we start today to live for love and learn to love maybe America will indeed be great. Otherwise, greatness is that mirage in the hot desert heat. You can see it there but you’ll never reach it ever.